Mistaking high test scores in China as a measure of quality, the West has adopted an exam-orientated system. The Chinese, on the other hand, seem to be equally eager to embrace an English-style education. In 2016, Wycombe Abbey, a girls’ boarding school in Buckinghamshire, opened a sister school to students in Changzhou, a medium-sized city in China’s Jiangsu Province.2 Harrow, Dulwich College, Malvern and Wellington had already opened branches in larger cities such as Shanghai, Beijing and Chengdu. At a starting price of $20,000 the cost of such an education is hefty, especially as the average per capita income in Beijing and Shanghai was about $7,000 in 2016. But demand has been growing. Britain is not the only country that admires Chinese education. Nor is China the only country that wants a British-style education. There is a peculiar movement of mutual admiration between traditional Western nations and Asian countries. It goes way beyond borrowing teaching methods, textbooks, or programmes such as A-Levels and IGCSE. It includes all aspects of education, from curriculum to pedagogy and from school hours to assessment. Over the past two decades, Western nations such as the US, UK and Australia have become increasingly infatuated with education in East Asia. This obsession originates in the simplistic and misguided view of good test scores as educational excellence. It all began with the Trends in International Mathematics and Science Study (TIMSS), a test for 8- and 12-year-olds. In the 1990s, East Asian education systems, represented by Singapore, Hong Kong, Japan, and South Korea, topped the international TIMSS league tables. Their superb scores, especially compared with the relatively mediocre performance of Western nations, prompted Western education systems to look East. The US promoted maths textbooks from Singapore; ‘lesson studies’ from Japan showed how Asian teachers worked. Chinese education became the new object of desire after its stunning performance in the 2009 round of the PISA (Programme for International Student Assessment) tests in maths, reading and science that are taken every three years by 15-year-olds around the world. Students in Shanghai aced in all three subjects.3 (They would do the same again in 2012.) The results of students in Britain, US and Australia were disappointing – average to begin with, and trending down thereafter. Mistaking test scores in a few subjects as the measure of educational quality, Western media, the operators of PISA and TIMSS, politicians and education pundits came to the conclusion that Asian education was superior and worth emulating. An overwhelming number of media reports lionized Asia’s ‘great’ education; academic texts such as Surpassing Shanghai: An Agenda for American Education Built on the World’s Leading Systems (Tucker, 2011), and Catching up: Learning from the Best School Systems in East Asia (Jensen, 2012) reinforced the message that the West is doomed because of its horrible education, while China and other East Asian education systems prepare their citizens to unseat it as the new dominant power. To win this competition, the West must become more Chinese, at least in education. 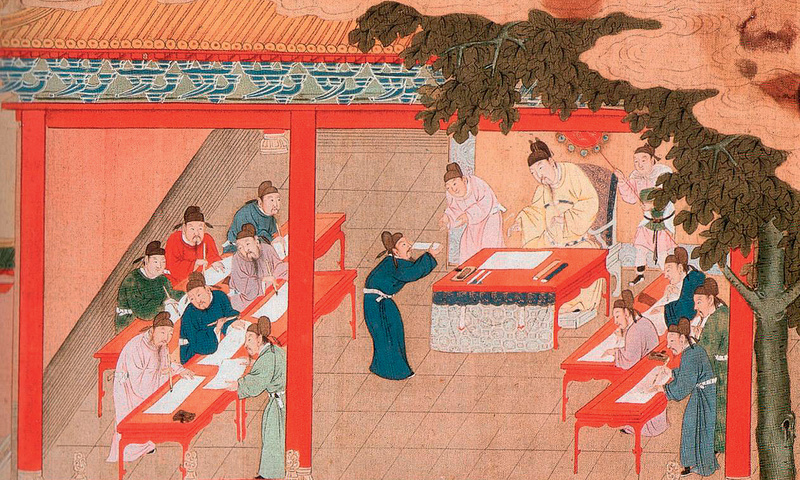 The results are increasing efforts to copy Chinese (and East Asian) education. They push the key elements of an exam-oriented education: centralization, standardization and mechanization. Education in the West has seen more centralization of authority in deciding what every student should experience in schools. The Australian Curriculum, the Common Core movement in the US, and the UK National Curriculum exemplify the attempt to standardize children’s learning experiences across the entire nation, ditching their own tradition of decentralization. The use of high-stakes standardized testing has also been increasing over the last two decades to hold schools and teachers accountable for delivering exam-oriented teaching. NAPLAN in Australia, No Child Left Behind (NCLB) mandated tests under President George W Bush and the common assessment efforts pushed by the Obama Administration in the US have successfully imposed a more homogenous experience on all children; education has become much more mechanical and mindless, with rote learning and routinized instruction now the standard diet. Alongside this has come a push for higher standards in core subject areas (numeracy and literacy), longer school hours, more homework, higher test scores required for entering the teaching profession, and an ever narrower curriculum. This effort to import East Asian educational practices amounts to a fatal attraction. In the words of a Chinese saying, it is ‘drinking poison to quench one’s thirst’. The West is thirsty for better education, but the practices it tries to emulate carry disastrous consequences as has been well recognized in their land of origin. Asian educations may be top scoring, but there is wide dissatisfaction with traditional practices and policies.5 ‘School life is usually monotonous, students are not given comprehensive learning experiences and have little room to think, explore and create,’ complained the Education Commission in Hong Kong, as far back as 2000. Exam-oriented education hurts students’ ‘motivation and enthusiasm, squelching their creativity, and impeding their overall development,’ lamented the Chinese National Education Commission in 1997. And so it is that ironically, while Britain and other Western nations are eager to replace their education practices and policies with those from Asia, Asian nations seem equally eager to embrace and experience Western education. In addition to the elite few who have been sending their children to schools in the West or Western-style schools in Asia, Asian education systems have engaged in massive reform efforts. Instead of reducing academic success to test-scores in a limited set of subjects (literacy, numeracy and science), all four East Asian systems have been expanding and redefining education outcomes to include what are commonly known as 21st century skills: creativity, communication, collaboration, and higher-order thinking; they are also interested in students’ social, emotional and physical health. Instead of more centralization, Asian systems have been gradually loosening central control and granting more autonomy to local governments and schools in curriculum, pedagogy and assessment. Instead of more testing, Asian systems have been trying to reduce both the frequency and importance of exams in schools. China, for example, has limited both the number of tests in primary schools and the use of standardized tests for admissions. South Korea has also drastically reduced the importance of exams for entrance to university. Instead of more rote learning, Asian systems have engaged in massive efforts to transform pedagogy, to move away from the traditional approach of direct instruction that emphasizes knowledge transmission and memorization toward an approach that is more student-centred and inquiry-based. Instead of narrowing the curriculum, Asian systems have enacted reforms to broaden students’ educational experiences beyond the traditional academic subjects, emphasizing moral education, the arts, physical education and social skills. Instead of lengthening school hours and increasing homework, Asian systems have enacted policies to reduce students’ academic burden and limit the amount of time devoted to school subjects outside the classroom. China, for example, has prohibited schools from offering extra tutoring sessions in afterschool hours or during summer and winter holidays. This mutual attraction between the West and East is unhealthy and swapping of this nature is unlikely to solve anyone’s problems. It is uncertain to what extent Britain, US, Australia and others making their schools more Asian will lead to higher test scores (evidence so far suggests not). Would the West be happy with the price that comes with high test scores? East Asian education systems have realized that good results are not the same as the ability to succeed in a rapidly changing society. What matters a lot more is what East Asian education has failed to cultivate, or effectively destroys: creativity, confidence, life-long learning skills and entrepreneurial spirit. Education is a future-oriented enterprise but the current exchanges are oriented toward the past. If there is anything they can learn from each other, it is from their ideas for the future. In this regard, the East seems to have a better vision: an education that aims to cultivate innovative citizens who care about their community and social responsibilities. Human society is entering a new age marked by swift technological change, as well as rising challenges such as environmental degradation, the displacement of human workers by machines and widening inequality. We need to invent a new education paradigm that can cultivate uniquely creative and collaborative individuals to meet these challenges and take advantage of the new opportunities. No current education system does this very well. Thus everyone is at the same starting point. Those who are first to invent education fit for the new world will lead the future. The new paradigm may make the current educational problems in both the West and the East disappear without solving them, just like the arrival of automobiles wiped away the crisis of horse manure in the world’s big cities at the turn of the 20th century. Yong Zhao is a former teacher raised in China’s Sichuan province. He is a Foundation Distinguished Professor in the School of Education at the University of Kansas and a Professorial Fellow at the Mitchell Institute, Victoria University. OECD, Review of National Policies for Education: Korea, 1998. Y Zhao,‘What Works Can Hurt: Side Effects in Education’ in Journal of Educational Change, Vol 18, No 1, 2017. T Wagner, The Global Achievement Gap: Why Even Our Best Schools Don’t Teach the New Survival Skills Our Children Need – And What We Can Do About It, Basic Books, New York, 2008. Y Zhao, ‘A World at Risk: An Imperative for a Paradigm Shift to Cultivate 21st Century Learners’ in Society, Vol 52, No 2, 2015.